Over the past weekend Anglican Pacifist Members joined other peace groups (FOR and MPF) in Leeds for their annual conference; Letting in the Light: Positive Steps for Peace in a Turbulent World. Although she was unable to attend, former APF Chairman, Mary Roe sent this wonderful reflection. Greetings to all conferring peacemakers! Although I am not able to join you, it’s a great joy to imagine you getting together to plan and pray for the peace which sometimes feels further off now than ever. I sometimes find myself thinking along the lines of, “If only so-and-so hadn’t done whatever in the year of Lord, X, X ……” or, “Why on earth didn’t the Government see this coming?” But I know that this is absolutely the wrong way to look at the terrible state our world is in. It’s an admission of defeat, an acceptance of the triumph of evil and, worst of all, a denial of the Resurrection hope that we have in Jesus Christ, symbolised by the cross of nails. We must remember always to replace the backward-looking words, “if” and “why?” with “when?” and “how?” which is what you are doing at the Conference. It’s easier to do this when we remember the many Muslims who, knowing that the word “Islam” means “Peace” are working hard to remind their brothers and sisters of this, and also the Jewish people whose lips frame the word, “Shalom” many times every day, many of whom are also working to bring peace and justice to Palestine. Have a fruitful conference and enjoy the fellowship I have always found in the A.P.(F)! Mary Roe read theology as a mature student and went on to teach in secondary schools, as a tutor for ordinands and lay readers in training in the Diocese of Ely. 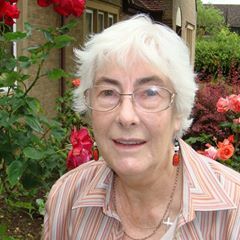 Mary is the widow of Gordon Roe, a former Bishop of Huntingdon, and is a Lay Reader in the Diocese of Oxford. She was Chair and is now a Counsellor of the Anglican Pacifist Fellowship and a member of the Modern Churchpeople’s Union.